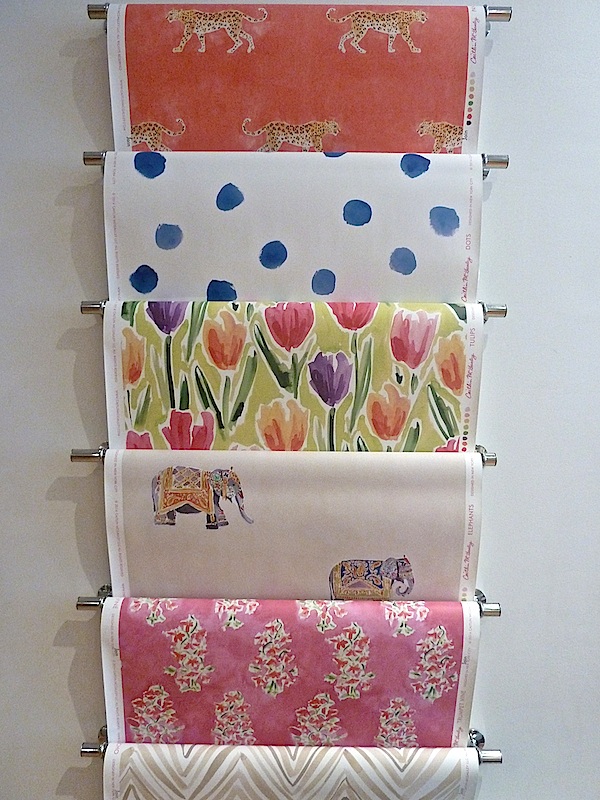 offers another way to add a colorful artistic touch to your home. 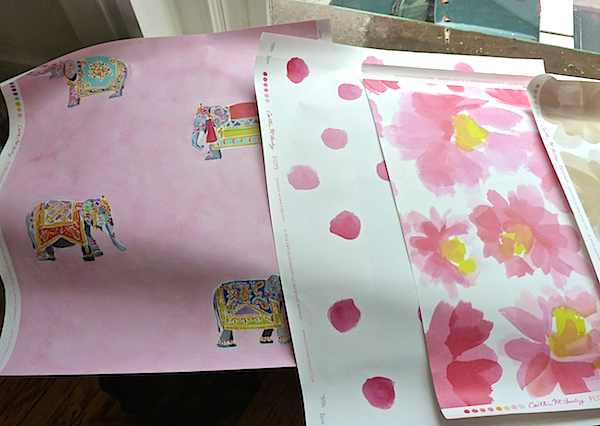 With a painterly style and whimsical attitude, they are a cheerful addition to the collection. 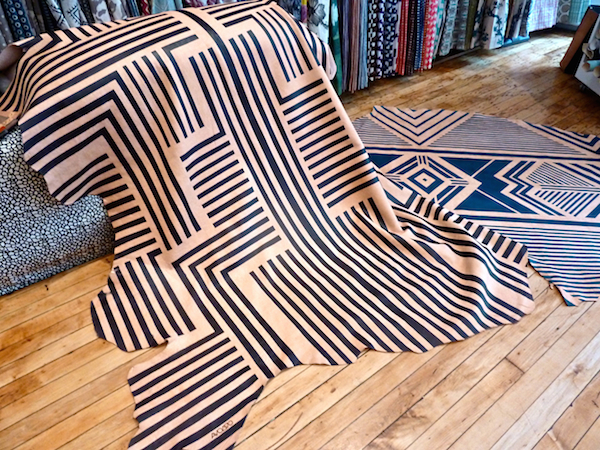 Brit Kleinman’s hand painted leather hides for her company, Avo, are all about using “traditional materials in innovative ways.” Starting with the natural shapes of vachetta cowhides, she uses water-based stains to hand paint her one of a kind rugs, each offering a bold graphic appeal. 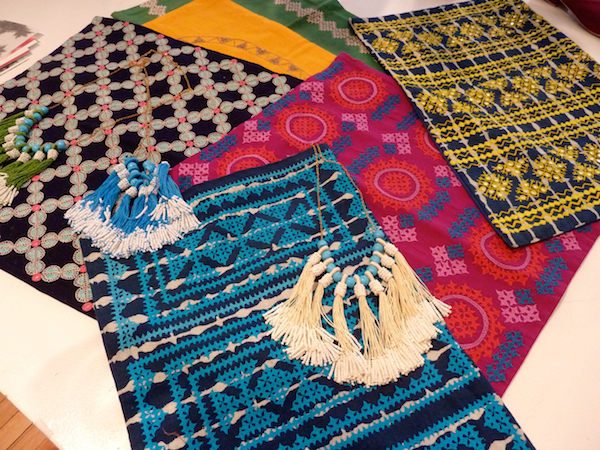 Tulu textiles (also represented at the studio) alum Clare Frost brings her exotic embroidered pillows and irresistible yek do se necklaces to Studio Four. We discovered that the more of these we piled on, the better they looked! 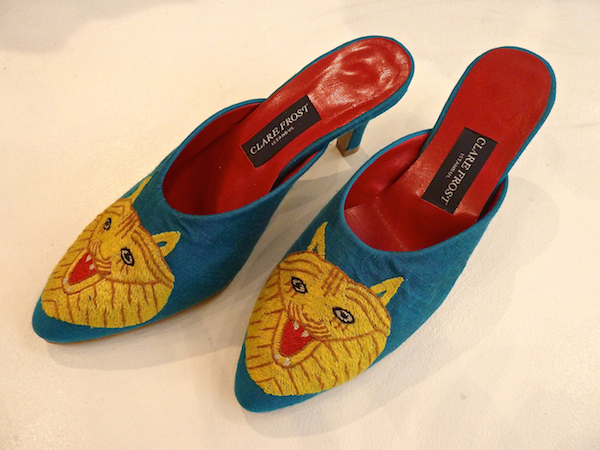 And her magic slippers are just right for adding a dose of stylish whimsy to your wardrobe. There’s much more coming from Studio Four that we’ll take a look at when they move into their new space. 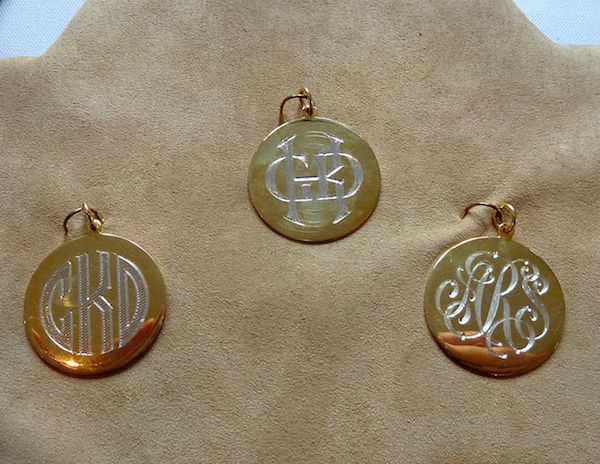 to new custom creations like these antique inspired monogrammed discs, their collection is always chic and unusual. 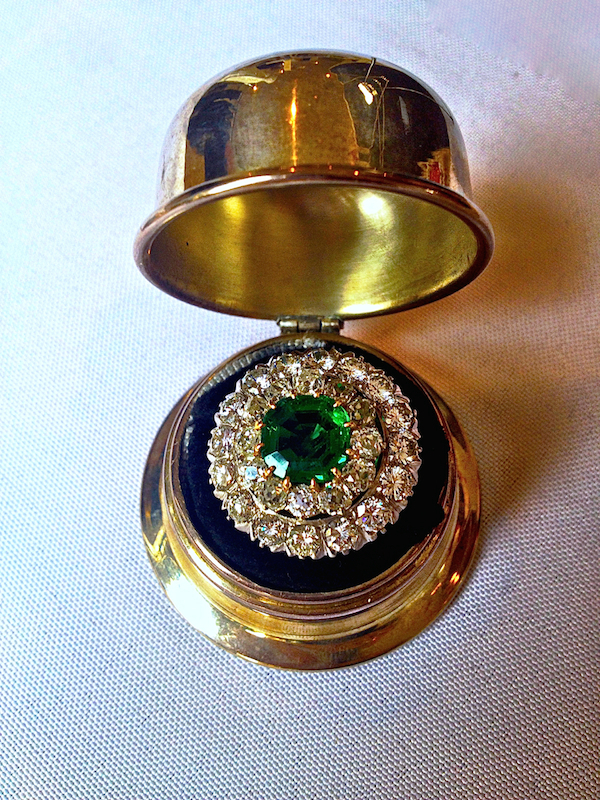 This antique ring contains a large Columbian emerald surrounded by the original miners cut diamonds and then a row added later in the 1950’s. Quite the statement. 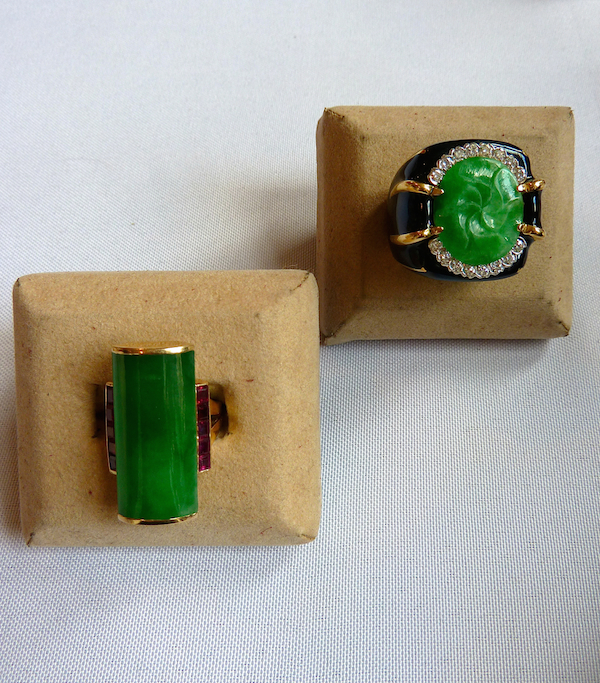 Lately I’ve been rediscovering the versatility of green and was intrigued by these stylish jade rings. But coral is always on my list. 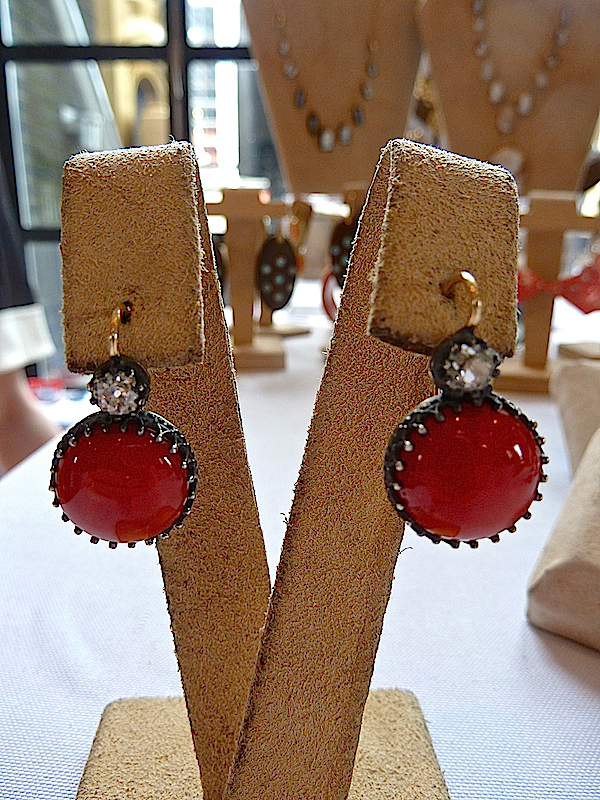 These earrings may look old but they are newly set to emulate an antique setting. 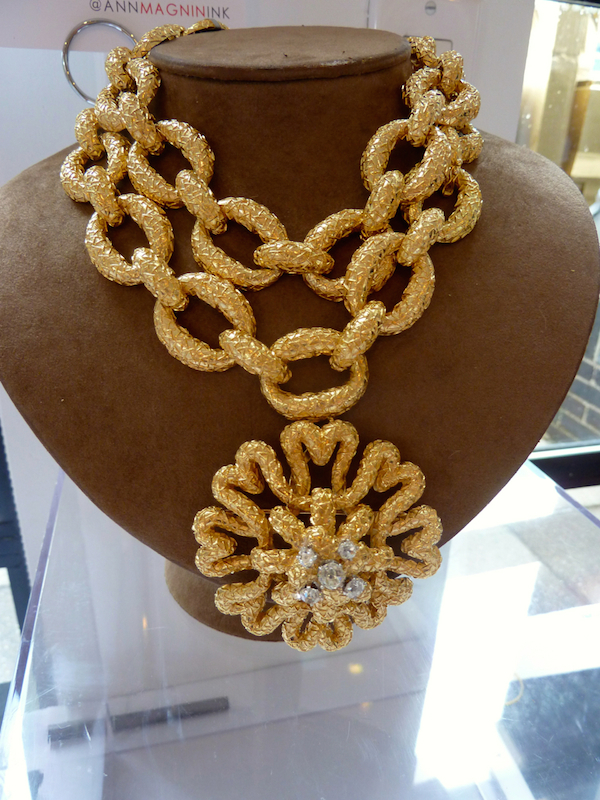 Michael C. Fina is a third generation family-owned jewelry store that has been serving customers since 1935. Great for both personal or corporate gifting and registries, they have an enormous selection of both jewelry and tableware. At the event, they brought a small selection of luxury offerings. 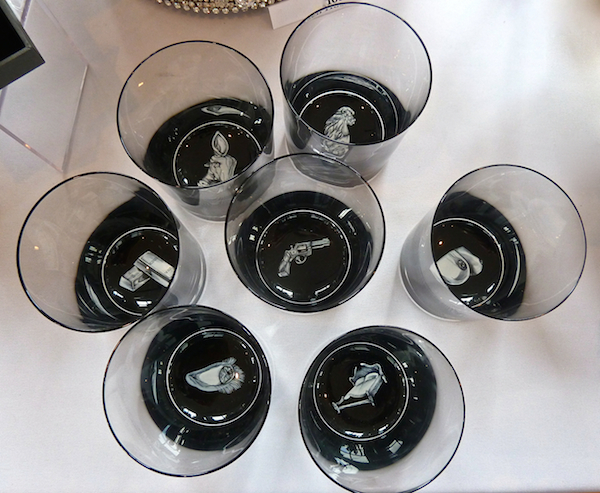 Already a longtime fan of Austrian glassware company Lobmeyr, I loved these 7 Deadly Sins Tumblers, sold individually. 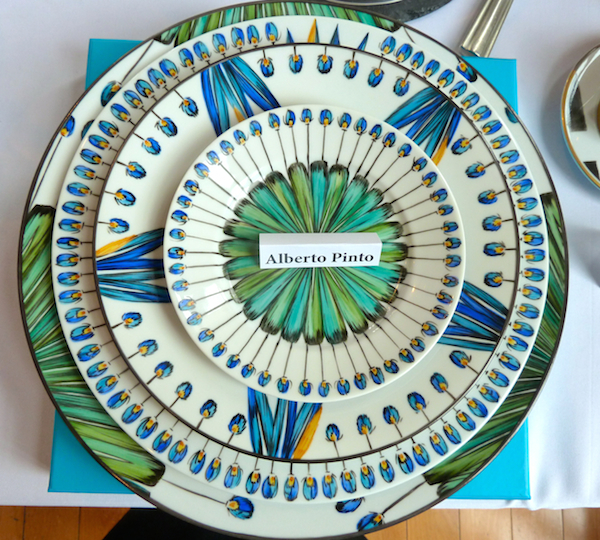 Alberto Pinto’s brilliant tabletop designs live on and his Bahia pattern is a fresh mix and match favorite. A final company worth remembering as the holidays approach is Soffia B. 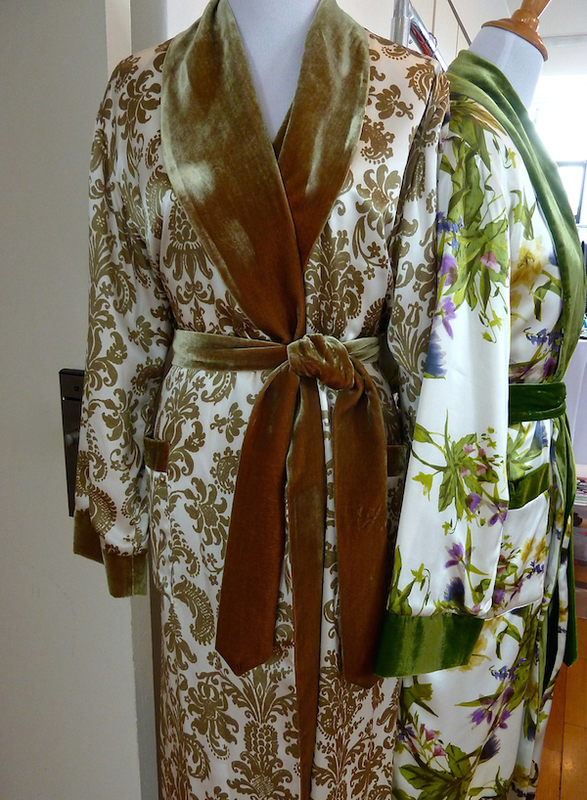 Her cotton flannel lined silk robes and dressing gowns would be a luxurious winter indulgence. 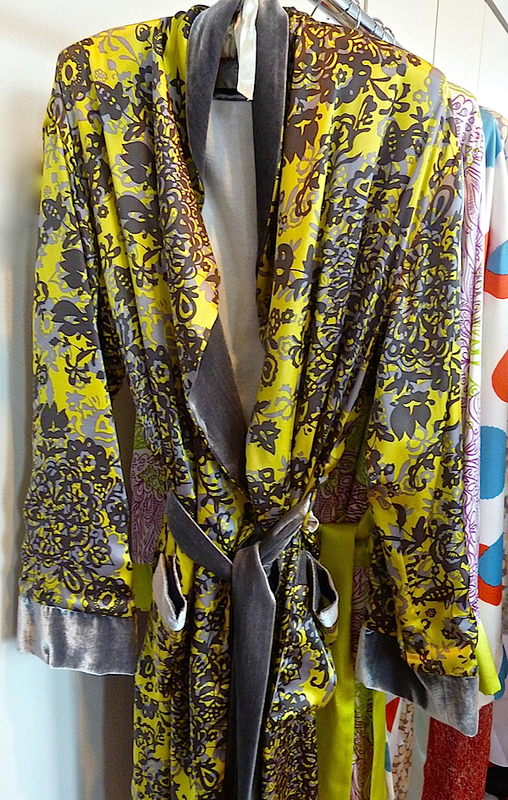 many with velvet details and sashes. I realize it may be hard to think about winter warmth on these hot and humid days so you might want to just bookmark the page for when you are preparing your holiday lists. Someone may be very happy you did! This entry posted in design, fashion, gifts, interior design. 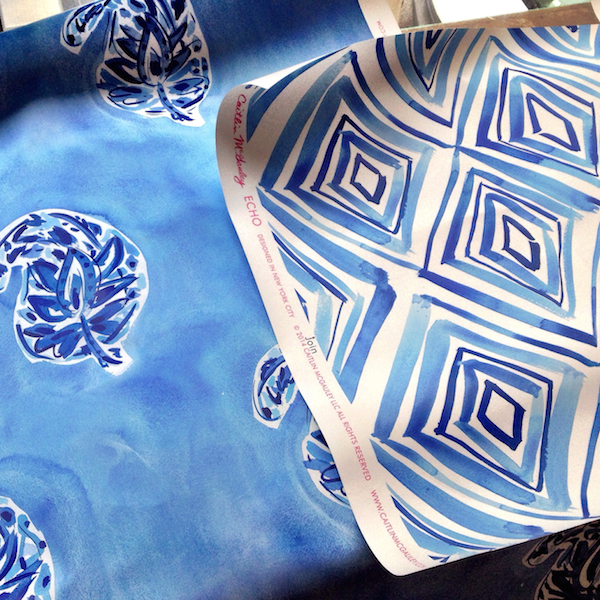 Entry Tags: Caitlin McGauley wallpaper, interior design, Studio Four, Textiles Bookmark the permalink. spectacular preview — merci beaucoup! Oh my goodness, what lavish delights you’ve shown us here, my need bone is twitching now. Always fun to read your delightful blogs Stacey!! Stacey you really do know me! 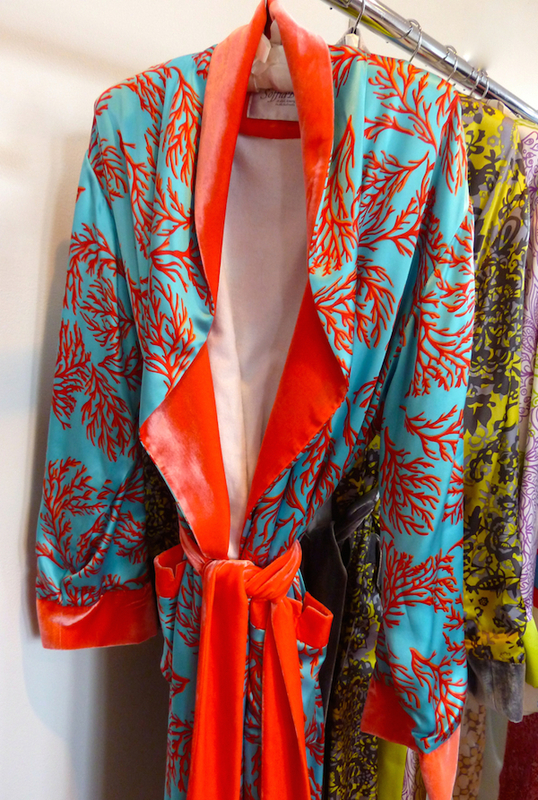 First the artistic creations of Studio Four, then Pinto’s Bahia patterned china which I adore , and I am wanting one of Sofia B’s Coral Branch robes to wear after this next surgery, it would wrap me in healing light! 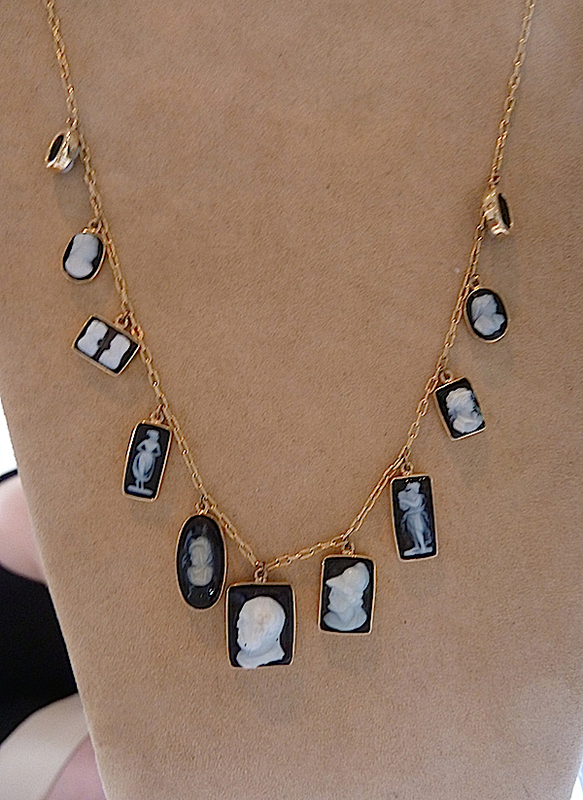 Excited to see the expansion at Studio Four – thanks for the preview of their new lines and these luscious holiday gifts!